Macht mit: Berliner Aktionstage (2.-13.06) // Berlin Action Days // Journées d´action à Berlin | Vive le sabotage! Vom 2.-13. Juni werden die Berliner Aktionstage gegen die Welt der G20 stattfinden. Macht mit und schickt eure Termine und Ideen. Wenn wir eure Ankündigung bis zum 8. Mai bekommen, können wir sie in den Flyer aufnehmen! Organisiert gegen die Welt der G20! Aktivitäten ihre lokalen und globalen Themen in Bezug zum G20-Gipfel setzen. Breiter und vielfältiger Widerstand gegen die Welt der G20 und gegen die G20-African-Partnership-Conference. Demo am 2. Juni: 50 Jahre Ermordung Benno Ohnesorgs, 10 Jahre Heiligendamm. Demo am 10. Juni: Gegen die African-Partnership-Conference und für globale Bewegungsfreiheit. Bringt euch ein!! Gegen diese Konferenz regt sich bereits Widerstand. Ein breites Bündnis bereitet eine große antirassistische und antikapitalistische Demonstration für den 10. Juni vor. Der Konferenztermin soll am Ende der Berliner Anti-G20-Aktionstage stehen, den Auftakt macht eine Demonstration am 2. Juni. On the 7th and 8th of July the heads of governments of the 19 most powerful national states and the EU will meet in Hamburg to present themselves as competent managers in times of war and crisis. The summit serves the purpose to maintain a world order which is responsible for several wars and conflicts, global structures of exploitation, widespread poverty and over 6o million people on the run. The weekend of the summit offers us the opportunity to take the stage and send out a message of dissidence. On the streets of Hamburg, we can create a transnational world of resistance and visible solidarity. Yet, the resistance against the world of G20 also takes place aside from mega events with a high presence of media: in our everyday struggles against capitalism, racism, neo-Fascism, militarization, gentrification, sexism. Whether with the authorities, in our neighborhoods, on the streets, in occupied institutes or at work – everywhere in Berlin people are fighting for a world without exploitation and oppression, for global freedom of movement, solidarity and a good live for all. 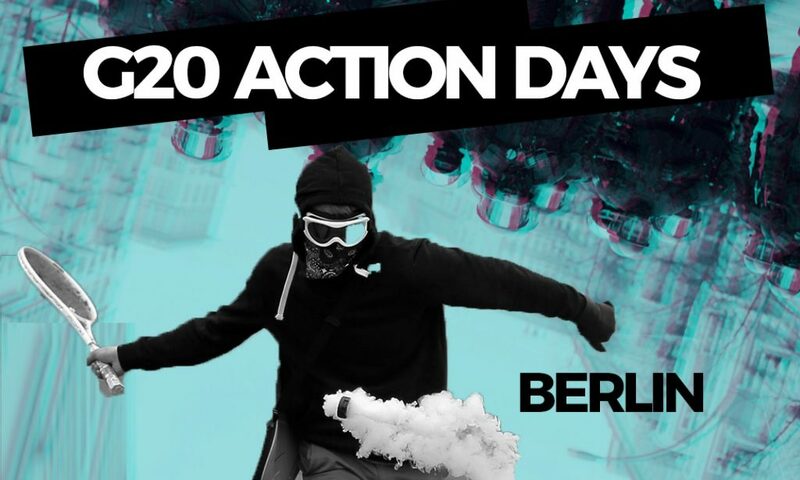 We call out for the Berlin Actiondays against the world of G20! We want to connect our different struggles and fights! Apart from the summit in Hamburg there will be many other meetings of the G20-group in Germany this year, e.g. the G20-African-Partnership-Conference, which will take place on the 12th and 13th of June at Gasometer in Schöneberg. In this city, where once the Berlin Conference took place and which therefore represents the colonial distribution and division of the African continent, the representatives of so called global leaders want to gather in 2017 to adjust their capitalistic and militaristic interests. While the German federal government isn’t ready yet to come up for any material recompensation for the genocide on Herero and Nama and the renaming of streets with colonial references is hardly realized and if at all then only thanks to pressure by anticolonial initiatives, they talk of “partnership” and mean to say collaboration. Collaboration with states which are willing to relocate the EU-borders further and further outward and to continually provoke the development and exploitation of ‘new markets’ (resources and humans) in the name of capitalist delusion of growth and expansion. Resistance against this conference already stirs. A broad alliance is organizing a huge antiracist and anticapitalistic demonstration on the 10th of June. The conference will be at the end of the Berlin Actiondays, which start with a demonstration on the 2nd June. Exactly 50 years ago, on the 2nd June 1967, Benno Ohnesorg was shot by Berlin cop Kurras on a demonstration against the Shah of Persia. The brutal repression against this demonstration and the murder revealed the neocolonial collaboration of the federal government with a murderous dictatorship and lead to a radicalization and enlargement of left movements in the 60ies. 40 years later, on 2nd June 2007, the big demonstration against the G8-summit took place in Heiligendamm. We remember it as a strong sign of transnational resistance. During the Berlin Actiondays from 2nd till 13th June we want to connect our different fights and strategies, with their diverse forms of action and spectra. We invite all to shatter Berlin with a week of agglomerated protest and resistance against the world of G20. Play a part in it with your fights and actions: rally against your Nazi neighbor, squatting to reclaim the city, events against sexism, a flashmob against the Federal Armed Forces or the authorities’ racism – everything should be possible within these 12 days. Furthermore, we want to refer to protest against the G7-summit in Sicily which is taking place a few days before (28th/29th of May). We are aware that every single day of the year must be a day of action. Still our goal is to create a moment in the beginning of June, in which all battles for a world of solidarity will be massively present in the city – with all our anger and hopes for another life. Journées d´action à Berlin: 2-13.6. Participez! Du 2 au 13 Juin, les journées d’action berlinoises auront lieu contre le monde du G20. Rejoignez-nous avec vos actions et envoyez nous vos idées. Si nous recevons vos idées jusqu’au 8 mai, on peut les inclure dans le planning! Organisons ensemble contre le monde du G20! Associez vos luttes et activités locales et transnationales à la protestation contre le sommet du G20.